Trevor did a robotics camp this summer and loved it. I stopped by to visit on the last day to snap some photos and watch Trevor's robot battle. It was pretty awesome. 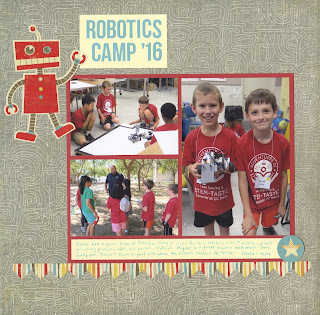 About the layout: I was really excited to be able to use the robot sticker to hold the title. I'm such a literal scrapper that I couldn't put a robot sticker on a page unless it was about robots, so it's been sitting in my stash for quite some time. I'd thought about grounding the robot so that he wasn't floating, but I picture him bouncing on that bottom border like a trampoline and decided to keep it that way. It makes me smile. The patterned paper is called 'Maze.' I've been hoarding it for years, waiting for the perfect photos to scrap once more about Trevor's love of mazes. That first maze layout is one of my all-time favorite pages, mostly because I included 3-year old Trevor's handwriting on it. Over the years, Trevor's love of mazes has decreased (slightly) as his love of robotics and engineering and more sophisticated puzzles has increased. Using this paper as the background for the layout makes sense to me. I'm happy with how it turned out and am glad to have it in the album. Loveeeeeeee this! LOVING that robot!!!!!!!!!!!!!! Everything about this page is just so perfect for those photos! That robot sticker is just perfect on this page! Glad you finally got to use it! Hi Cindy! I love your wonderful layout! It is so creative and fun. I especially like the way the little robot is holding the title. And the fact that everything on this layout means something! This is what scrapping is all about, my friend!